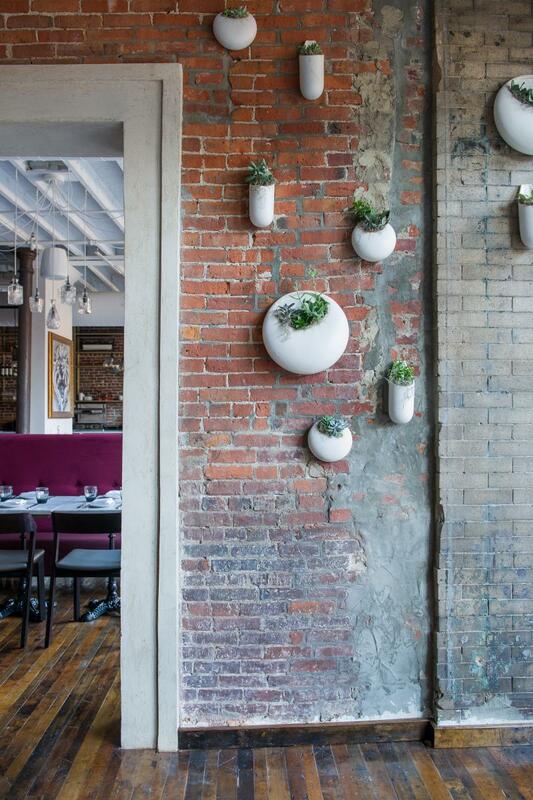 The Union Square restaurant, which is housed in a former sauce-factory, has a minimalist industrial feel that's been softened with plenty of plant life. The space is undergoing some changes at the moment, as the owners remove all ovens and sous vide stations. With a tenative reopening slated for April 21st, Journeyman will continue to serve their 9-11 course tasting menus Thursday through Sunday, but according to their website, the food will be cooked "on little more than wood fires." Monday through Wednesday, they will be taking a more casual approach, welcoming walk-ins and serving a la carte plates. Interior designer Petra Hausberger from Somerton Park Interiors in Brookline, found a way to give the Boston post of this New York-based Italian chain the look of a living wall, without too much upkeep,"We originally wanted to fill Serafina with potted herbs and realized it would take a lot of extra care to maintain them," says the designer. 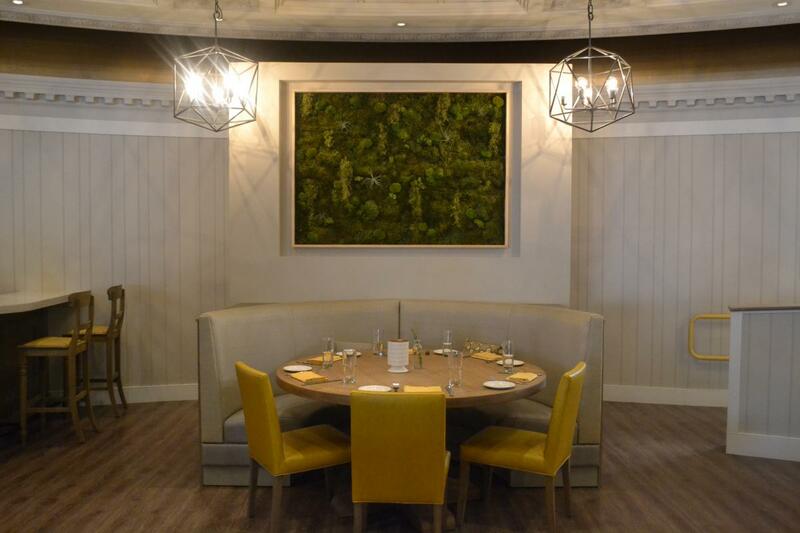 "I had seen some beautiful floral designs by Suphoj Chancheaw of Bloom Couture Floral Studio on Tremont Street and together we came up with a plan to use moss to create a work of art for the dining room." The moss has been dried, and sealed to provide longevity, so it doesn't need the irregation system which many living walls require. You get all the green without the gardener. Known for its modern American cuisine, Catalyst is currently serving spring-like dishes like their green-garlic potato soup, and orchiette primavera - with baby shiitakes, radish, spinach and parmesan. 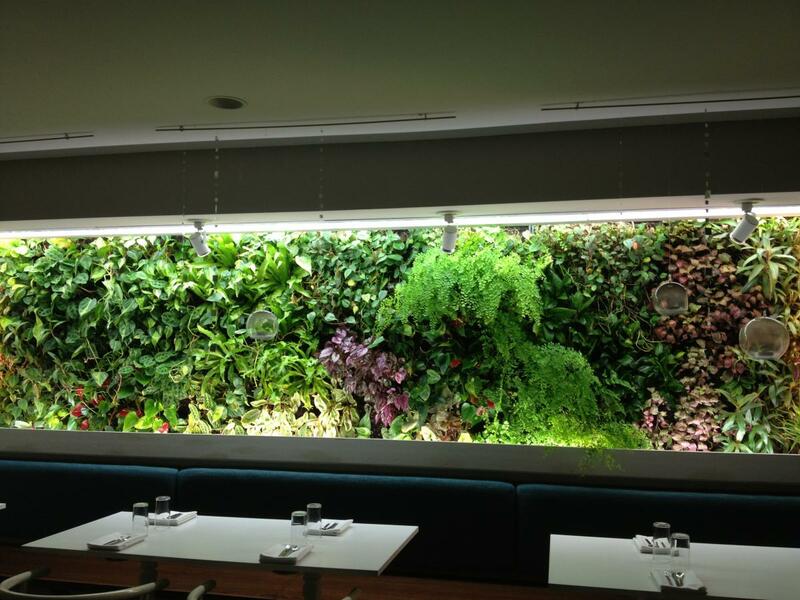 Boston florist Winston Flowers services their living wall, and the restaurant team has to turn heat lamps on the plants each night to keep them in good shape. But according to chef William Kovel, it's worth it, "When we designed the space, we wanted elements of nature: fire (fireplace), wood (barn board) and living plants. We decided not to hang art, but rather have the space be the art." Settle in at the bar for the best view, and transport yourself to warmer climes sipping the Tech Square cooler "it's better than drinking alone," a mix of mezcal, pineapple, cassis, and soda. 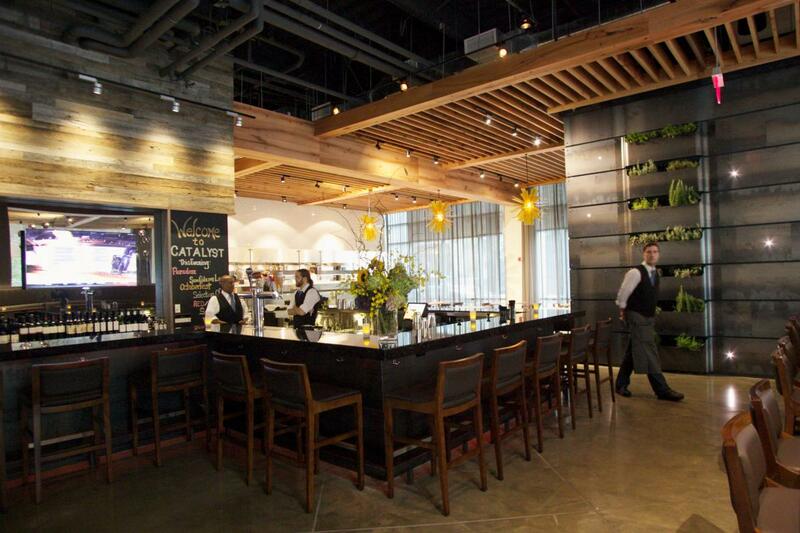 The Kendall Square restaurant is as ambitious with its decor as it is with the creative and painstakingly excecuted plates: foie gras with oysters; rib-eye with nasturium and quail egg; and handmade pici pasta with lamb heart ragu and sea urchin. 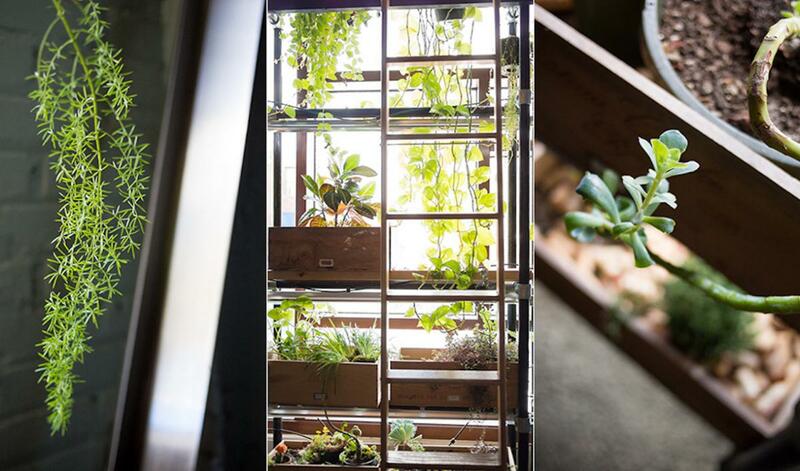 “The living walls at Study and Journeyman are surprisingly a lot of work. Everyone who passes by touches them, inquiring if they are real. We really wanted to add living things to the space, as buildings on their own are pretty dead," says owner/chef Tse Wei Lim. The South End wine bar is known for its ambitious wine list, and creative, Italian-focused cocktails, but its decor is also a major draw. 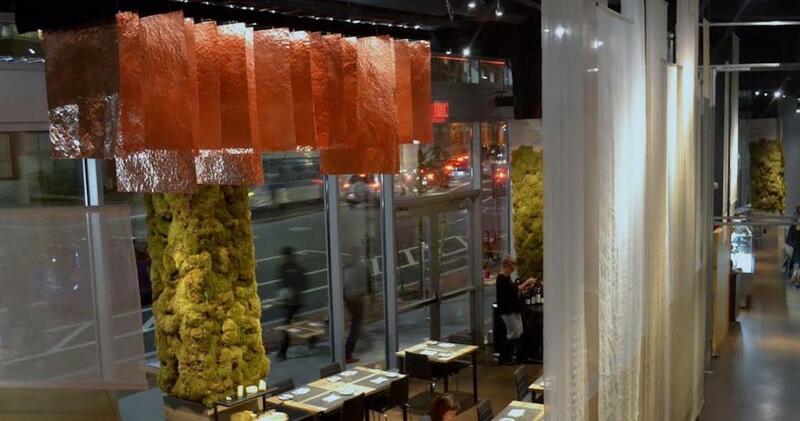 General Manager Ted Hawkins says, "We decided to add the living wall to bring some green into our space which has a lot of metal, exposed brick walls and somewhat of an industrial feel. We felt like the plants softened it up a bit." Nibble duck breast with black garlic and salsify; gorgonzola dolce and walnuts over chicory; or one of the pastas made from house-milled grain, and take in the modern interpretation of a Venetian baraco. This romantic little tapas restaurant focuses on Spanish and Carribbean dishes, and has the feel of those warmer, welcoming places. Manager Mayra Cabré tells us neccesity was truly the mother of invention when designing their downstairs dining room in a basement. "We wanted to bring nature and a tropical atmosphere to Casa B, making it feel like you are looking at an interior courtyard. Our idea of the green wall has been a success! Our downstairs dining area is our most popular and wanted space." The restaurant is currently offering half-priced tapas Sunday through Thursday from 5-6 p.m., so you can sip mojitos, and snack on small plates for a very affordable mini vacation. This juice bar is jamming at lunch hour, with a line snaking through the restaurant for their plant-based grain bowls, creative salads, and lucious smoothies. Our favorite drink is the spicy lust alive, with strawberry, banana, cacao, candied ginger and cinnamon. 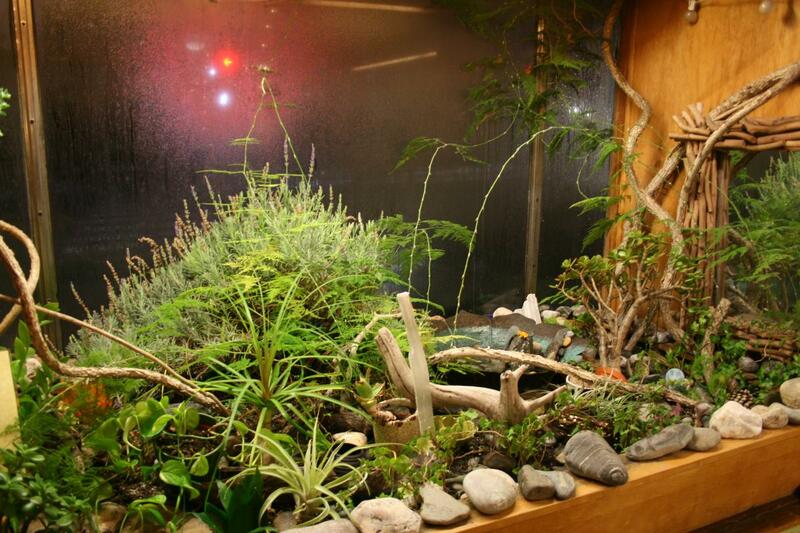 Place your order and investigate the wild terrarium while you wait.